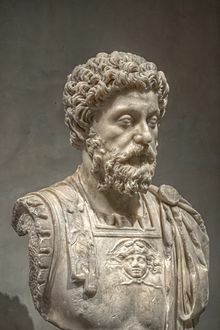 Marcus Aurelius Antoninus (A.D. 121 - 180) was Roman Emperor and wrote his Meditations during his campaigns against the barbarians. The following is a personality profile of Marcus Aurelius based on his work. Marcus Aurelius is shrewd, somewhat inconsiderate and informal. He is laid-back, he appreciates a relaxed pace in life. He is unstructured as well: he does not make a lot of time for organization in his daily life. But, Marcus Aurelius is also proud: he holds himself in high regard, satisfied with who he is.